Kraven the Hunter donated a boatload of animals to the Central Park Zoo. 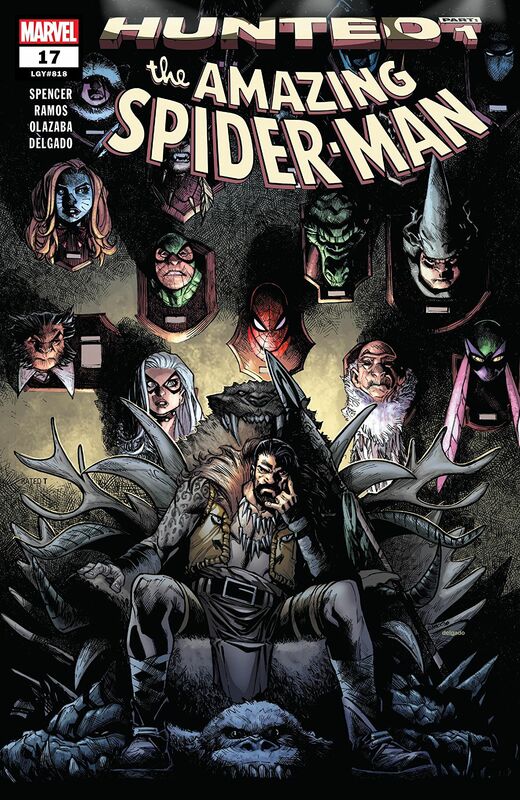 Marvel’s most prolific big game hunter dropped nearly two dozen animal-based characters, from Armadillo to White Rabbit, into a fight for their life in the latest Amazing Spider-Man. At the center of the chaos was Spider-Man and Black Cat. The 38-point book topped the solo title releases thanks to the menagerie of supporting characters. Dead Man Logan (36) and Tony Stark: Iron Man (35) followed closely behind for best performing books for the week. Logan featured Mysterio, another infamous Spider-villain, helping the X-Men turn the tables on his former partners Sin and Miss Sinister, while Iron Man continued Tony’s digital downfall in the eSCAPE. Apocalypse, despite spreading his own brand of love in the “Age of X-Man” event, snagged an Antagonist of the Week title with six points spread out across two books. However, neither title could top the latest Avengers: No Road Home from scoring the most points in an event book yet again with a score of 45. The top book overall went to Asgardians of the Galaxy, which again featured two teams. The Asgardians and Yondu’s Ravagers worked together for 48 points to quell the rampaging Ego and protect the civilians living on his surface. The book also saw Angela lose two partners. Her girlfriend Sera, after displaying some magical aptitude, decided to stay behind with her new team and Kid Loki’s summoning spell ran out leaving the Asgardians short one trickster. The next closest team book in terms of scoring came from X-Force and its 29-point performance. Despite defeating Ahab, the deadly team of mutants came face-to-face with Stryfe, their latest threat who already upped the stakes when he laid Warpath low in the closing pages of the book.